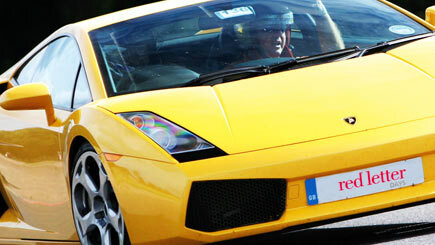 Drive four of the most famous supercars in the world. Start with an introduction and briefing on circuit driving techniques with a professional instructor. Next it's time to drive four laps in each supercar. The stunning V8 Vantage and DB9, the unmistakeable Ferrari F430, the brutal and uncompromising Lamborghini Gallardo and fantastic rear-engined Porsche 911. There's so much that's undeniably impressive about these cars and this is a rare chance to experience them first-hand. Also included is a special certificate of participation. Driving may be cancelled or curtailed in extreme weather conditions like ice or heavy rain, when driving at speed might become dangerous. You'll be contacted if the experience is cancelled for any reason. The experience lasts around three hours. This includes a briefing, tuition, driving time and a debrief. Please arrive 45 minutes in advance of the booked time to ensure a prompt start. Around 18 people take part, split into teams of three and each team with their own Association of Racing Drivers Schools instructor. Dress comfortably (and warmly in winter) and wear narrow, flat-soled shoes to negotiate pedals that are close together. Helmets are provided.